"I want to make macarons," my sister said to me one day, with the same nonchalance with which she brushes her teeth. Horrified, knowing what it involved after a lesson at Canelé, I tried to impress upon her the artform that was macarons. Not to be dissuaded, she promptly bought everything she needed and embarked upon Project: Macaron. Intrigued, I was drawn into helping out, and eventually I spent the whole of today making macarons on my own, which explains this post. 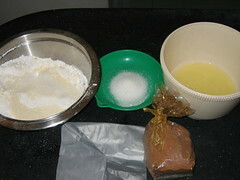 Notes on ingredients: You can buy ground almonds from the supermarket or Phoon Huat, but the latter sells very coarse almond flour that you have to grind down again. You can get Silpat at Shermay's Cooking School. 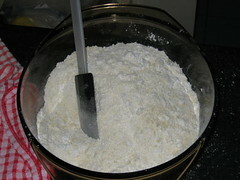 Sieve the icing sugar together with the ground almonds into a big bowl. If your almond flour is too coarse, grind it down in a pestle and mortar and sieve it again, rather than discarding it right away, as that makes your macaron mixture too runny. 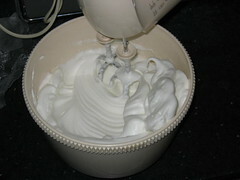 Beat the caster sugar and egg whites in a mixer on high speed till you get a nice meringue that forms stiff peaks. Fold the meringue into the almond flour and icing sugar. This bit is tricky, because you don't want to overmix your meringue and dry ingredients, nor do you want to err on the side of caution and leave unmixed egg whites in. You need to mix quickly and exactly, without undue nervousness or energy. The original recipe calls for you to knock out some of the air from your whites by a few judicious strokes of the spatula, but I'd recommend only two or three quick strokes. 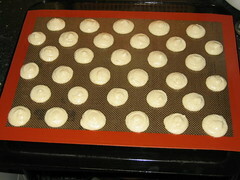 Fill a large piping bag with the macaron mix. It should not be runny, rather, it should ooze slowly, much like sludge. 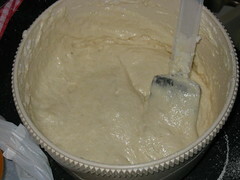 Pipe circles of the mix onto the Silpat-covered baking tray. 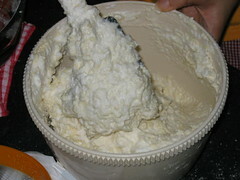 Be very controlled in your piping, otherwise the mix will spread all over the place and ruin your efforts. This is also the time you find out if you're mix is too runny or too dry. It's better to fall on the side of runniness - if your mix is too dry the little peaks from piping will not melt gracefully back into the piped circle, and if it's runny your circle quickly becomes much larger than you had envisioned. You can dust them lightly with cocoa to decorate, which is also a sneaky way of obscuring any cracks that may occur during baking. 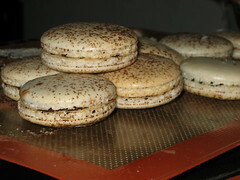 You can see that these macarons were piped a little too close together, so some estimation is required while piping. Preheat your oven to 160°C. Macarons, almost unlike any other confection, are an exercise in delayed gratification. After piping them out and dusting them if you wish, it is a very good idea to let them rest, in an air-conditioned environment, for about fifteen minutes (or two hours, if you can wait). 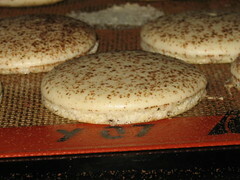 This enables the macarons to form skins, giving them that glossy sheen, and prevents cracking when baking. Place the macarons in the oven, centre rack, for 14 minutes, by which time your macarons should have risen slightly (or a lot, if you chose not to beat out the air), and developed a little skirt round the edge. 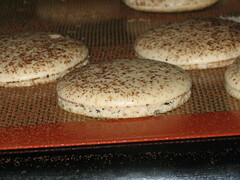 Allow the macarons to cool down in an air-conditioned environment while you prepare your filling. 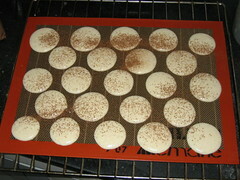 This makes it easier to turn them over, without leaving great big bits of macaron mix on your Silpat. 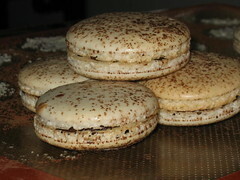 The macaron fillings can be almost limitless in variety; buttercream and chocolate ganache tend to be the most common. 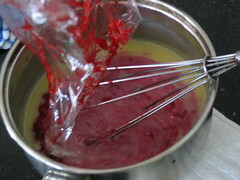 Here my sister is making a raspberry-white chocolate filling. 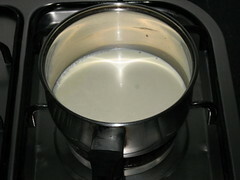 Heat the cream and butter till boiling. 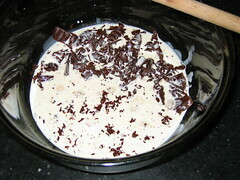 Pour the boiling cream over the chocolate and emulsify, till you get a gloriously glossy bowl of melted chocolate. Once that happens, you can refrigerate it for about 20 minutes, or leave it in an air-conditioned room for an hour to cool to piping consistency. 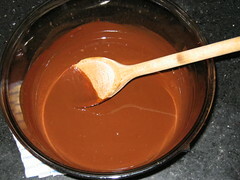 If you leave it in the refrigerator for too long, stir the hardened chocolate thoroughly with a wooden spoon till it liquefies. Do not be impatient to pipe it, or your chocolate filling will be too firm. Fill a piping bag with the chocolate ganache and pipe some onto one half of a macaron before sandwiching it with another half. Like I said, macarons are an exercise in delayed gratification. You could eat one now, but its texture will be slightly crunchy; not quite the melt-in-your-mouth quality that characterises the most sublime of macarons. 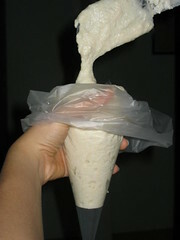 To achieve this, you need to refrigerate them overnight; to be enjoyed the next day. It's not often I have the patience or precision to devote an entire day to confection, but macarons occupy an entirely different plane of existence. For an in-depth tutorial on macaron-making tips, do read J's excellent post on the subject. We decided to have a proper breakfast on our third day in Hong Kong, which was basically milk pudding from Yee Shun Milk Company. Unfortunately, they were closed (at 9.30am - atrocious), so we had breakfast at one of the diners nearby. These diners are really interesting - quite different from our usual coffee shops, even though you can grab a quick meal of toast, eggs and coffee at both. 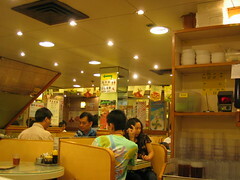 Hong Kong diners offer all kinds of set meals, from sandwiches to hot dogs to more traditional stuff. I decided to go traditional and ordered a bowl of wan ton noodles, which surprisingly arrived with no visible wan tons - they were all buried beneath the stringy noodles. The noodles were excellent; thin and springy, with remarkable bite that characterises hand-made noodles, almost impossible to find in Singapore these days. 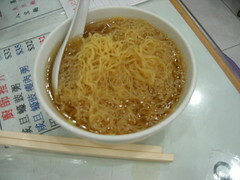 What was even more amazing than the noodles, though, was the wan ton. 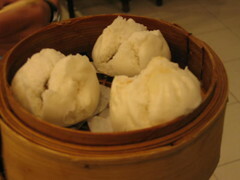 I don't think anyone hand-makes wan ton anymore, let alone wan ton as incredibly delicate as these were. The skins were smooth and gossamer-thin, not like the rubbery rubbish you get here, and the fillings were bursting with flavours from the pork and shrimp. We took a day-trip into neighbouring Shenzhen, and had the worst meal of our trip - a char siew rice with barbecued meat that was almost pure fat and swimming in oil, proving that it's not just the shoppers who get ripped off in China. 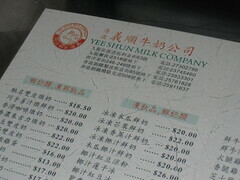 Disappointed that we'd missed a chance to have some delicious milk pudding, we headed back to Yee Shun Milk Company for tea. 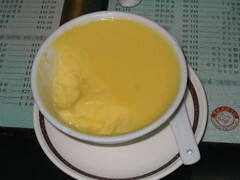 I sampled their egg custard, which was excellent - all silky smooth and chilled, neither too eggy nor too characterless. 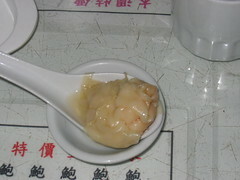 Yee Shun also does a steamed milk pudding with two skins, which I didn't like as much; but it's a great casual spot to meet friends over a comfortable pudding. 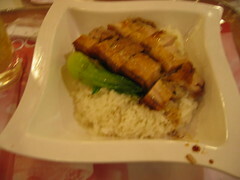 Dinner was at the Tsim Sha Tsui area, a place with a name like Happy Garden Noodle Restaurant or something. I ordered a bowl of char siew noodles. While the noodles weren't as mind-blowing as the ones I had for breakfast, the generous portions of char siew, each marbled with a nice ripple of juicy fat, more than made up for it. Deciding to be adventurous, we ordered a roast pigeon, which turned out fabulously. 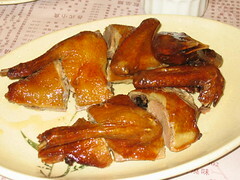 Unlike roast chicken, pigeon has less meat, but is also less oily. 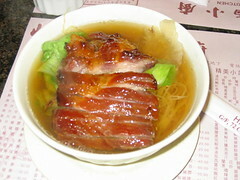 It was the first time I'd had pigeon, and fears of bird flu notwithstanding, it was actually pretty delicious. Our breakfasts in Hong Kong tended to be fairly quick affairs, given that we still didn't know what people ate in the mornings. 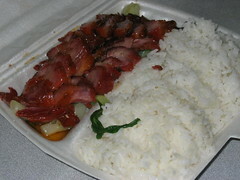 On our way to Victoria Peak, we popped into another convenience eatery called Can:teen. 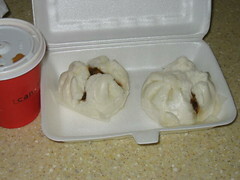 The char siew paus I had for breakfast were actually not bad; fluffy and filled with sweet barbecued meat. Day Two was spent in search of some eateries recommended by my sister, who's an old hand at exploring Hong Kong. 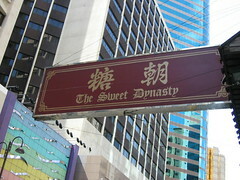 One of these places is Sweet Dynasty, which is a really outrageous pun on the Chinese word 'Tang'. It's apparently famed among Singaporeans for its desserts, which are indeed various and sweet, but they also do regular meals. Its popularity is fairly obvious - the place is packed with people, from grannies to kids; clearly Sweet Dynasty isn't just a marketing gimmick. 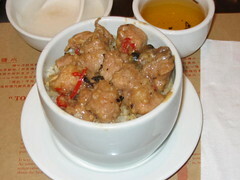 I had a double-steamed rice with pork ribs, though they weren't really ribs, more like assorted pieces of bony meat. No meal in Hong Kong is complete without dim sum, so we decided to order a few items from Sweet Dynasty's (very limited) dim sum menu. 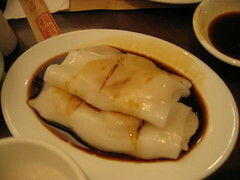 The shrimp rice flour rolls weren't bad, sweet and delicate and smooth all at the same time. 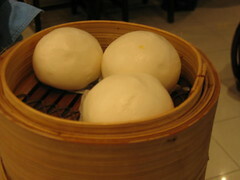 The steamed rice flour balls filled with custard, though, were quite appalling. The custard filling was powdery and coarse, dry and tasteless. I was rather disappointed by this sad offering. The char siew paus weren't much better; we agreed that the ones I had for breakfast were vastly superior, and given that they came from a convenience eatery, did not speak well of Sweet Dynasty. Nicholas ordered us a ma la gau, which I'd never heard of before. 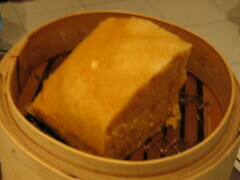 Eventually we learned it's the same thing as what I call a thousand layer cake (qian cheng gau), but the one at Sweet Dynasty looked like a big sponge. Again, nothing particularly impressive. The saving grace, thankfully, was dessert. 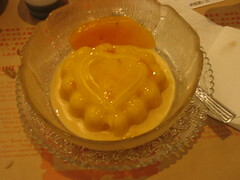 I had the mango pudding, which came embedded with generous cubes of sweet mango fruit. The pudding was firm and creamy, a fairly uplifting finish to an otherwise uninspired meal. 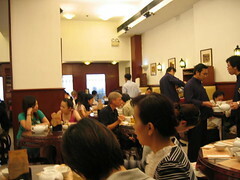 I'm not sure what makes Sweet Dynasty so popular, but it's probably not the food. 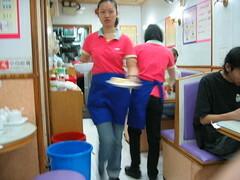 As we spent most of the evening in the vicinity of Ladies' Street and the Temple Street Night Market, we meandered our way into one of the ubiquitous restaurants bordering the road (after first being careful of avoiding any eatery that had any tourists or Westerners in it). It apparently served award-winning fishballs, and after tasting one, I could see why. Firm and fleshy, it was plump, succulent and bursting with intense flavours without being overpoweringly fishy. 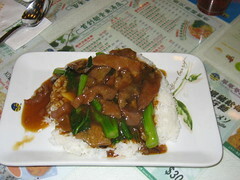 I had a stir-fried sliced beef dish served over steamed rice. Simple and luxurious, the sauce was rather heavy on the cornstarch, but they were quite generous with the beef, and I was only too happy to get away from the numerous dodgy-looking seafood stalls that virtually screamed 'tourist trap' to complain about the food. Our first meal in Hong Kong was lunch, and as it was late, we were too hungry and desperate to go hunting down recommendations from our Lonely Planet guidebook, so we decided to just pop into the nearest convenience eatery. 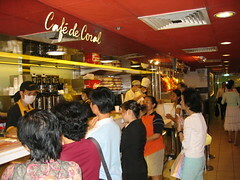 There are loads of "Cafe de Coral" outlets around Hong Kong, a little like our foodcourts, except that the whole place is occupied by one stall, AND you pay upfront, even before you order your food. My roast pork rice was rather mediocre; although if you do find yourself eating here, their char siew rice is much better. I feel we were rather spoiled, as it was arranged by an extremely generous Mr. Edmund Ching that we should have dinner at a restaurant he is a shareholder of. FINDS, short for Finland, Iceland, Norway, Denmark and Sweden, is one of the top restaurants in Hong Kong, in fact Lonely Planet lists it as the top restaurant in the Central/Lan Kwai Fong area, an excellent meeting venue for a pre-clubbing meal. Given that it was Monday evening, there were no pre-clubbing crowds, so we were fortunate enough to experience the full force of their extremely polished service. Our every need was seen to by the helpful and friendly staff, and dinner was to be a multi-course degustation prepared by Executive Chef Jaakko Sorsa. 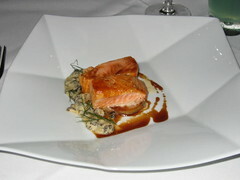 Our first course was a fish-heavy offering designed to showcase the variety of Scandinavian cuisine. There was a lavaret mousse, smooth and cloudy, perfect with the restaurant's home-made crisps of dark rye bread. Next was a sort of gravlax, cured slices of salmon seasoned with dill. 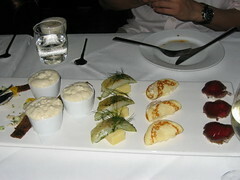 There were also some potato blinis folded over a lavaret fumet, and some smoked venison to round off our plate of starters. 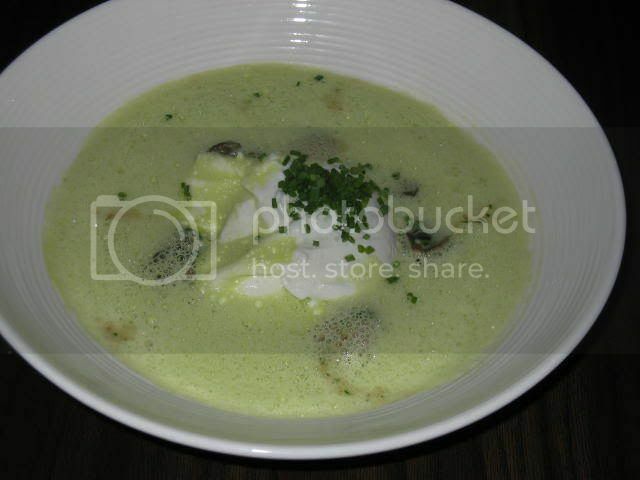 An excellent beginning, and a real eye-opening experience into the sophistication of modern Scandinavian cuisine. This was quickly followed by lightly-grilled salmon in a morel sauce. Chef Jaako has an exquisitely deft touch with his seafood, using extremely fresh ingredients and combining robust flavours with muted ones, hence the salmon and morel pairing. As an aside, the restaurant manager, a Swiss, told us that Swiss morels are edible straight from the ground, while Finnish morels were poisonous and had to be boiled twice before they could be eaten. Intrigued, I have since discovered that this likely refers to the false morel, as all true morels are edible. Our next course was an amazing tomato soup. 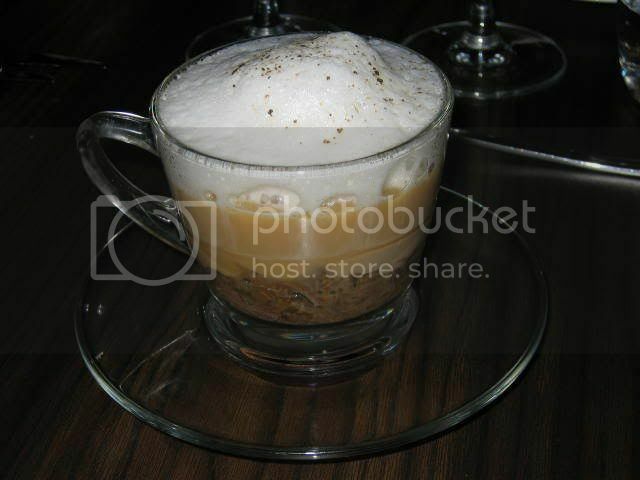 It was so foamy that you could literally just dig into it with your spoon; it was like eating a cloud. The best thing about it was that it was so intense, yet so clear, almost as if it was just pure tomato essence. Imagine our surprise when Chef Jaakko revealed that the soup was made from pounds and pounds of red tomatoes, distilled till only the clearest tomato oils were obtained. Little surprise, then, that we all enjoyed this immensely. Our first meat course was a venison tenderloin, a fairly robust meat that was served with some glazed vegetables and a celeriac puree. Venison imparts a stronger flavour than beef, but the tenderloin was surprisingly soft and easy to eat all the same. I was getting kind of full by this point, but there was no stopping the chef. 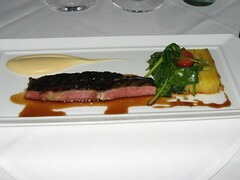 Next came a cut of ribeye that had a healthy and tender marbling of fat ensuring an extremely succulent slice of meat. 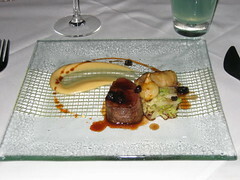 The parsnip puree served as a secondary sauce and helped to balance out the richness of the steak. Dinner finished with a platter of desserts, including some homemade yoghurt sorbet, a fantastic chocolate mousse cake, an interesting rhubarb soup and a fresh fruit jelly. Incredibly stuffed and delectably satiated, I was most grateful to my gracious host for giving me this rare opportunity to enjoy some really amazing cuisine. 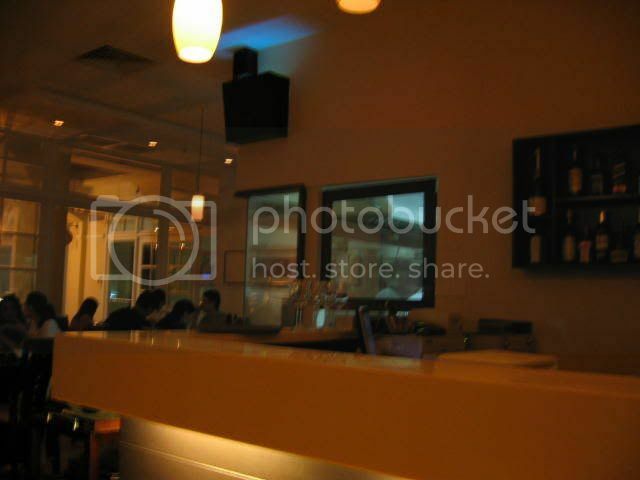 FINDS is definitely a restaurant you should visit if you're ever in the area. I know it's a bit gratuitous to post a review of Sage after the extensively-covered food bloggers' dinner, but I thought a more objective review might be better, and fairer, to both readers and restaurant. Of course, how 'objective' the review is is questionable, given I've been here before and the staff know me, which is usually not the case in most of my other incognito reviews. Still, I'm willing to give them the benefit of the doubt. 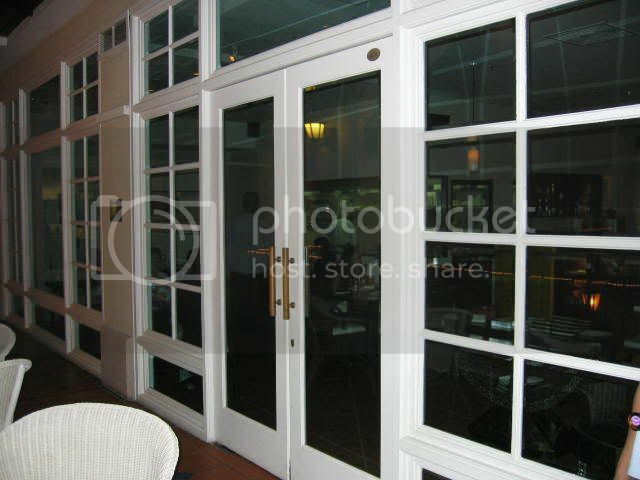 The restaurant's unassuming exterior is nice and understated, almost like the frontage of a residential verandah, which mirrors their food and reputation - a subtlety that belies their true sophistication, rather like the herb which is their namesake. Ambience here is fantastic, with large mirrors and french windows that create an impression of space, but ample mellow lighting and dark wood furniture still manages to convey cosiness. I'm greatly impressed by Chef Jusman's ability to work out of such a small kitchen, rivalled only by Oscar of Buko Nero. Unlike Oscar, though, Jusman clearly has no qualms of people watching him work, as there's a chef's table right in front of the kitchen that allows you a generous view. 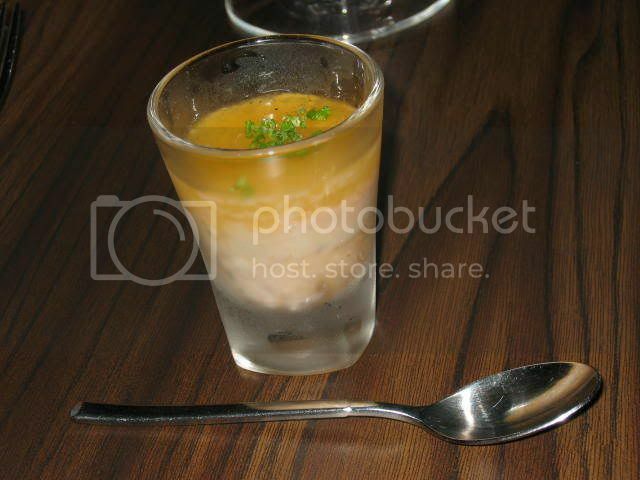 Our complimentary amuse-bouche took the form of a sort of pork gravlax with a citrus dressing. The meat itself tasted like a coarse pate, chilled and flavourful, its richness balanced out by the sourness of the citrus. Certainly enough to pique the interest and appetite, setting the tone for the rest of the dinner. Once again I had Chef Jusman's creative interpretation of escargots - a fricassee of Burgundy escargot with lentils du puy, field mushrooms, poached egg and Italian parsley foam. I used to think that some classic dishes are so hallowed that they should never be changed; but truly great cooking is not merely reproducing what's been done - it's dynamically reinterpreting what others never imagined possible. 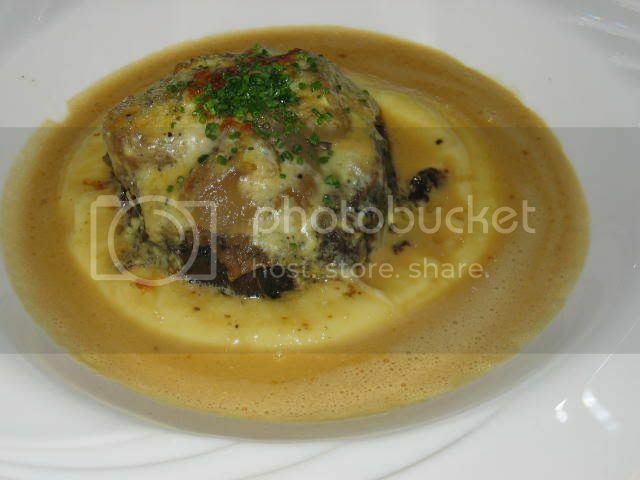 The fricassee of escargot is just such a dish, excellent in both conception and execution. The richness of the poached egg's yolk takes the place of the traditional butter, and the pairing of escargot, mushrooms and lentils works magnificently. 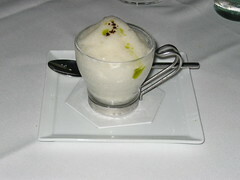 The parsley foam, too, is a masterstroke of presentation. Having cut his teeth (and burnt his hands - check them out) at the Hilton's Harbour Grill, Jusman has certainly learned well. A restaurant lives and dies by its foie gras, so we duly ordered a portion of pan-fried foie gras on caramelised Granny Smith apple slices, paired with golden raisin puree, and an emulsion of Muscat grape jus and beurre noisette ($8 supplement). The first thing you notice is that the foie gras is huge. It's been a while since I've seen such a generous portion of foie. The second and last thing you notice before you lose yourself in this wonderful serving is that Chef Jusman definitely knows his foie gras. Rich and sinfully smooth, the natural fatness is rounded out by the sweet apple slices and raisin/grape emulsion. The addition of some walnuts provides a brilliant contrast of textures as well. After hearing me extol the numerous virtues of the chestnut and oxtail soup, it was inevitable that my entire family decided to try it. Once again, it was amazing, almost as good as when I put the first spoonful in my unsuspecting mouth at the floggers' dinner, but only because allowances have to be made for diminishing utility. The soup is not available on the regular menu, but I strongly urge anyone going to Sage to call Kimberly and place an order for this amazing consomme. It's not something you should miss out on. 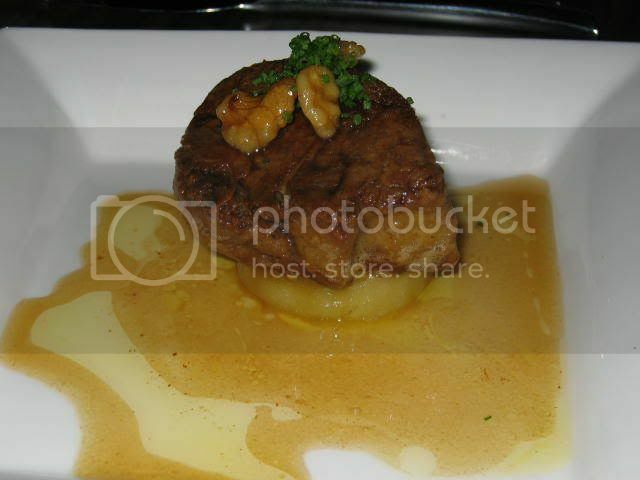 I decided to try something new for my main course, so I went with the gratineed medallion of grain-fed Angus beef cheek topped with marinated shallots, potato aligo and reduced braising jus. Slow cooking seems to be a specialty of Jusman's, as virtually all the red meats on the menu are braised. Clearly playing to your strengths pays off, because the beef cheek was good. Not as exceptional as the braised short-ribs, but definitely a dish that you can't go wrong with. A friend highly recommended the chocolate souffle with home-made vanilla ice cream and Grand Marnier custard ($6 supplement), so I thought I'd be adventurous with dessert as well. When the souffle arrived, I was somewhat disappointed, as the crust felt hard and overbaked. 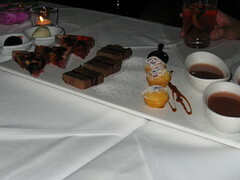 My disappointment turned to awed surprise, though, when I discovered that it was no ordinary chocolate souffle at all. 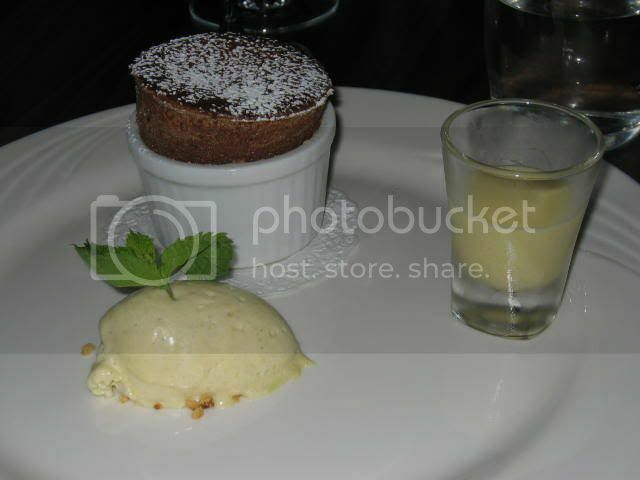 As you spoon into the souffle, you find the centre oozing molten chocolate, exactly like a molten chocolate cake. This is such an extraordinary feat (I've never even heard of such a thing, let alone seen it done before), that I was quite willing to overlook the fact that the souffle is not quite as ephemeral or classic as, say, Au Petit Salut's. In fact, if the souffle needs to be overbaked in order to achieve that gloriously molten centre, then give me an overbaked souffle any day. Once again, hard (or in this case, meringue-soft) evidence of Chef Jusman So's wonderful ability to surprise the most jaded of diners with the most inventive takes on traditional favourites. The only thing I didn't like about this dish was the Grand Marnier custard, which while creative, just seemed somewhat out of place. So far I've been waxing lyrical about the food, and not been paying much attention to service. I'd be doing Kimberly, the restaurant manager, a grave injustice, if I did not say she and her well-trained staff provide top-notch service and attention. Her pleasant disposition and impeccable manners are an equal to Jusman's inspired and talented cooking. If any couple can be called the 'dynamic duo' of the local restaurant scene, then I think that accolade must surely be accorded to Jusman and Kimberly. The only minor point about service is that food can take a little while to arrive, which to me makes complete sense because it only gives you more time to enjoy the dinner company and work up an appetite to better enjoy Jusman's offerings. Sage remains a little-known eatery, and tragically they've stopped offering set lunches except on Fridays (3 courses for $25 / 4 courses for $28), but their dinners remain one of the best valued (3 courses for $50 / 4 courses for $55, excluding price supplement items). I am often asked which is my favourite restaurant, and I think I can now confidently say that that honour goes to Sage, and I only wish I had discovered them sooner.